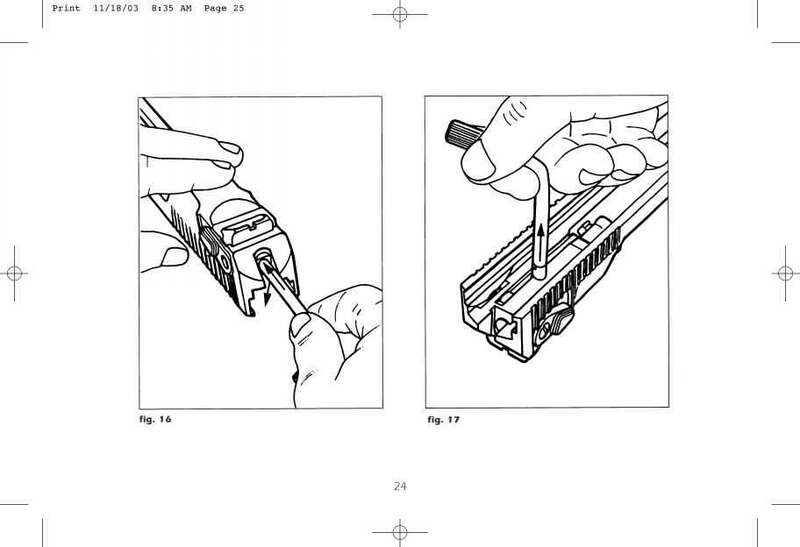 ■ A safety catch, operable from either side, blocks the firing pin and at the same time disconnects the trigger from the firing mechanism. ■ The pistol chamber is chrome plated to facilitate easier cartridge case extraction. ■ The polygonal rifling reduces barrel wear and enhances the obduration between the bullet and the bore, thus increasing accuracy. ■ Field stripping is simple since the pistol has only six main parts, including the magazine. 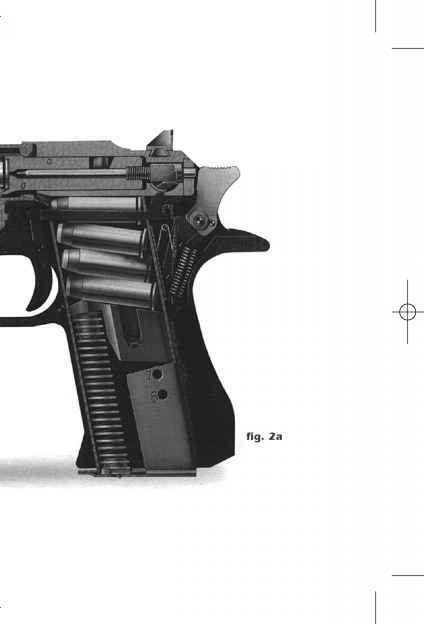 ■ The rotating bolt interlocks with the barrel during firing. ■ The barrel assembly contains the gas operating system. Anatomically formed grip, ideal hand seating angle and comfortable grip dimensions permit rapid, accurate, instinctive shooting. The combat-type trigger guard is designed for two-handed shooting. Closed construction gives adequate protection against dirt. Most parts are manufactured by precision casting and machining to strict military standards and with the 'traditional Israel Military Industries' dedication to quality and durability. Technical data may not be exact due to production/model/specification changes. Prior to firing the pistol, the bolt is locked by three lugs in the barrel assembly. Upon firing the pistol, propellant gases pass through a hole underneath the bore of the barrel into the gas cylinder and push the piston, which in turn moves the slide backwards. During this movement the bolt is unlocked and carried to the rear by the slide, but not before, the pressure in the chamber is reduced. 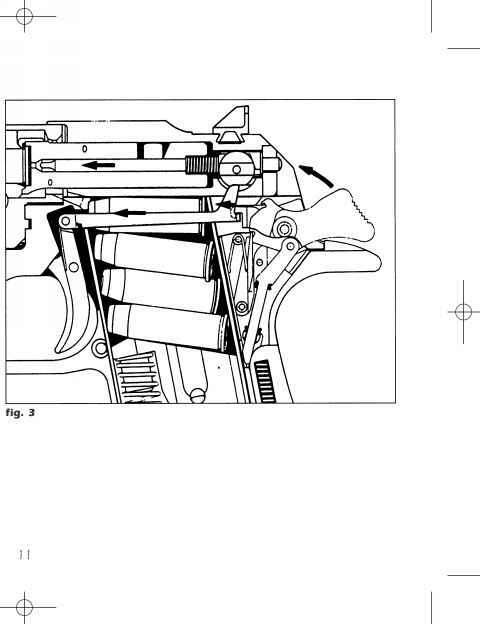 When the bullet has left the barrel the empty cartridge case is extracted and ejected by the continuing movement of the slide and the bolt to the rear. At the same time, the slide pushes the hammer downward into the cocked position, where it is retained by the sear. The recoil springs are compressed. 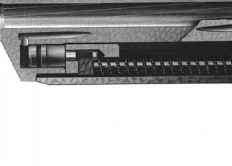 When the last cartridge is fired and the empty case is ejected, the slide is retained in its rear position by the slide catch. The slide catch is actuated by the magazine follower. The catch releases the slide when depressed by hand or when the slide is pulled slightly to the rear. The safety catch levers are located at the rear of the slide, just below the rear sight. They are accessible from either side of the pistol. When pushing the front end of the safety catch lever downward, the safety catch is engaged. 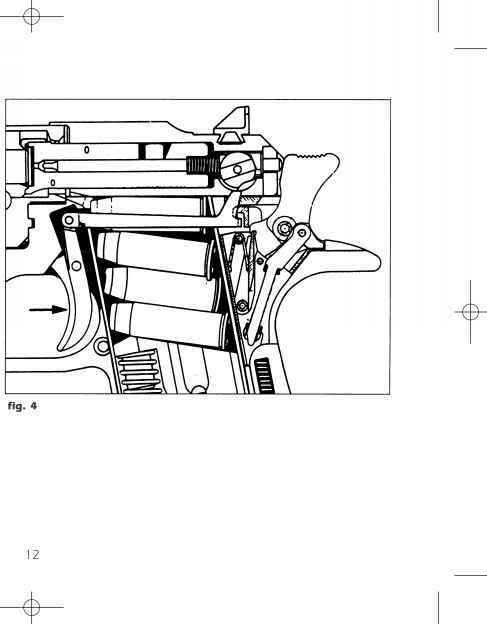 In this position the firing pin movement is closed by the safety catch and the trigger bar, which is pushed down, cannot engage the sear, thus neutralizing the trigger (fig. 4). It should be noted that due to the above features, it is not possible to engage the sear when the bolt is not locking properly. 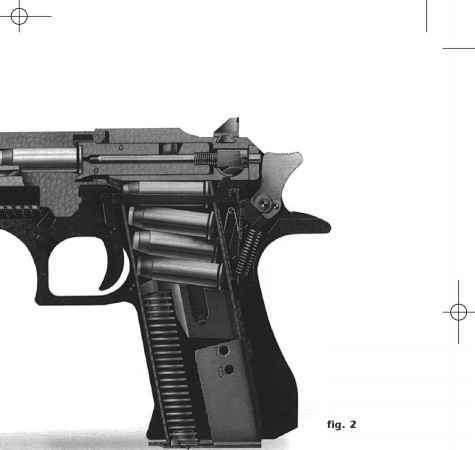 Due to the unique blocking of the firing pin by the safety, the pistol will not fire when dropped accidentally on its hammer or on its muzzle when the safety is properly engaged (on "SAFE").